BAGRAM, Afghanistan, July 1, 2010 (ENS) – Actor Jeremy Renner, who played a bomb disposal expert in the Academy Award-winning 2009 war thriller “The Hurt Locker,” was in Afghanistan this week to learn what the United Nations is doing to clear the country of landmines, the ultimate environmental hazard. 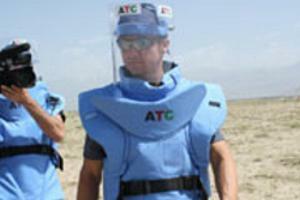 Renner toured UN demining projects in Kabul, Bamyan and Bagram, took part in a mine risk education session with high school students, spoke with survivors of explosions and ventured onto a minefield. Renner said he saw first-hand the benefits of the UN’s activities, particularly in former minefields where farmers are now growing wheat, potatoes and other crops. Demining success depends on the level of funding available for this dangerous, demanding work, and in mine-infested Afghanistan funds for this year amount to less than half of what is needed. For the year starting in April, the Mine Action Programme of Afghanistan has set a funding target for mine clearance of US$242 million. To date, only $94 million has been secured against this target, leaving a shortfall of $148 million. If the planned projects are completed, some 157 square kilometers of contaminated land could be returned to communities in a safe condition. 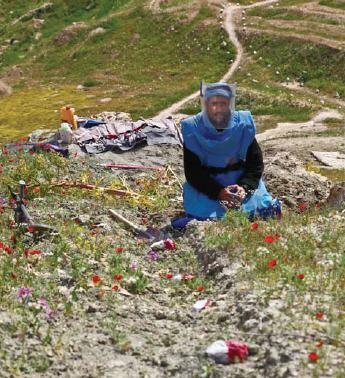 Despite the continuous efforts of the UN Mine Action Service and the Mine Action Coordination Centre of Afghanistan, the country is still riddled with mines, left from decades of conflict. Last year in Afghanistan, 40 people were killed or injured by landmines or other explosive remnants of war. This casualty rate is the lowest in a decade says the UN Mine Action Service. Throughout the country as of June 22, there were nearly 6,700 known landmines and other explosives in 2,127 communities spread across 654 square kilometers, according to UN figures. So far this year, UN deminers have cleared or canceled 63 minefields and three battle areas. They destroyed more than 11,000 anti-personnel mines, over 400 anti-tank mines and nearly 400,000 explosive remnants of war in the process. In Afghanistan, site of the world’s oldest and largest mine action program, the number of casualties dropped from more than 100 per month in 2005 to less than 60 per month at the end of 2009, due to the destruction of large numbers of landmines, including 84,000 mines in 2008 alone, according to the United Nations Mine Action Service. Yet new hazards continue to be found each year. And on April 11, four deminers were killed and 17 others injured in an attack in Kandahar in the southern part of the country. The demining team was working with the Demining Agency for Afghanistan, a nongovernmental organization based in Kandahar. “Mine action is a neutral humanitarian activity, which should not be confused with military operations in the country,” said Haider Reza, program director of the Mine Action Coordination Centre of Afghanistan, which is supported by the government and the UN and provides planning, management and quality assurance for all mine action activities throughout the country. The Ottawa Mine Ban Treaty bans all anti-personnel landmines and requires total clearance of mines from Afghanistan by a target date of 2013, but at this stage only 39 percent of the hazards have been removed. On December 3-4, 1997 the Convention Prohibiting the Use, Sale, Production, Transfer, and Stockpiling of Anti-personnel Landmines was opened for signature in Ottawa, Canada. The United States is among the 39 states that are not parties to the treaty. According to the 2009 Landmine Monitor Report, parties have destroyed more than 44 million mines since the treaty entered into force in 1999.